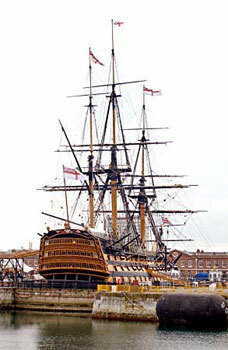 Nelson's flagship HMS Victory reproduced by kind permission of the Commanding Officer HMS Victory, Portsmouth, England. On 21 October 1805 a British fleet, under the renowned Lord Horatio Nelson, attacked and defeated a more numerous French and Spanish combined fleet off Cape Trafalgar on the Spanish coast. By the end of the day Nelson's fleet, with 27 ships of the line, had destroyed or captured 17 enemy ships, although Nelson himself died of wounds. The story of this action rapidly grew into a British naval legend, which by the late 19th century was seen to be the quintessential example of a decisive naval battle; one that resulted in over one hundred years of British naval supremacy. This is the story that has been accepted by innumerable school children and naval strategists alike, however, as with many historical tales, elements of myth and propaganda have had a large influence on how many perceive these events. Never in the history of blockades has there been excelled, if ever equalled, the close locking of Brest by Admiral Cornwallis, both winter and summer, between the outbreak of war and the Battle of Trafalgar. Even prior to 1805 Nelson was a British national hero, and it was his previous experience and daring character that led to his appointment as the commander of the Mediterranean Fleet in June 1803. His task was to blockade the French fleet at Toulon and their Spanish allies at Cadiz , while protecting British sea communications and Britain's allies in the Mediterranean. In March 1805 the Toulon Fleet, under Admiral Pierre Villeneuve, broke out past Nelson's blockade and sailed to the West Indies. The French plan to use what is now described as manoeuvre warfare to distract the blockading British fleets, and to combine all available French and Spanish forces in support of the projected invasion of Britain, was unsuccessful. Following Villeneuve's return to Cadiz in August, and the failure of the French fleet to break Cornwallis's blockade of Brest, Napoleon realised an invasion of Britain was no longer feasible. In a surprise strategic move, he ordered his Grande Armée towards the Austrian frontier and began the series of successful land campaigns that ultimately conquered much of continental Europe. Napoleon now ordered Villeneuve to enter the Mediterranean and land troops near Naples. In naval terms this order to land an expeditionary force along a coast that was defended by strong naval forces was clearly extremely risky. Napoleon, however, was quite specific on what he required when he ordered Villeneuve 'not to hesitate to attack superior or equal forces and to engage in fights à outrance. The Emperor would not count the loss of ships so long as they were lost with Glory!' The combined French and Spanish fleet sailed from Cadiz on 19 October 1805. Maintaining his open blockade of Cadiz, Nelson was promptly informed of the fleet's departure and was able to make all necessary preparations for a fleet action off Cape Trafalgar. The details of the battle including the subsequent death of Lord Nelson 'at the moment of his greatest victory', need not concern us too much here. It should be recognised that at the time of Trafalgar the British nation had been fighting an exhausting and at times bitter war against France for almost twelve years and was to continue to fight Napoleon for at least another twelve. Nelson's role as a national hero was important for British morale, as was the image of sailors and officers bravely fighting tooth and nail against everything that the resourceful enemy could throw at them. Both images must have contributed to the national war effort, as well as helping to counter the economic strain that the war was causing within the civilian community. The loss of 18 French and Spanish ships of the line - about 20% of the total - would have been significant in the short term, but the French shipbuilding capabilities, when combined with their allies and the increasing economic assets under the Napoleonic Empire, allowed these ships to be rapidly replaced. The human casualties of the battle would have been much harder to replace, as the French suffered from a shortage of experienced mariners. The French tried to overcome this shortcoming by the use of marine conscripts who, if somewhat short of marine skills, were mostly enthusiastic. Given such evidence Brian Tunstall's summary of the outcome of the battle appears more apt than the generally accepted panegyric: 'superficially, at any rate, the Battle of Trafalgar appears to have been one of the less important events of the war. Only a small part of Bonaparte's naval forces were destroyed and only one-sixth of the total British ships of the line were actually engaged'. No single naval battle can be decisive by itself, as it is not possible for naval forces to permanently secure possession of the sea in the way that it is possible to take land in a military context. Control of the sea, including the control of sea communications, is a fleeting condition that enables a maritime force to make use of the sea, but not to possess the sea. The result has been that the British nation, as a whole, has tended to concentrate its attention and memory on historic battles, and to look on them as having won the war, instead of being mere incidents in the general war strategy. This relation between battles and strategy is amply proved by the fact that during the war of the French Revolution and the Napoleonic wars, which lasted on and off for twenty years, only six battles of first class importance took place: the Glorious First of June, Camperdown, St Vincent, the Nile, Copenhagen and Trafalgar. Yet the same strategy underlay all our dispositions throughout the twenty years of war, and it was due to our unfaltering adherence to that strategy, rather than to battles, that the war was won. For modern navies sea battles are only decisive when they form part of a strategy that utilises sea control to subsequently influence events on land. In modern parlance, the application of one's naval strength directly against an enemy's strength forms the basis of attrition warfare. When success in war at the operational and strategic levels depends on the ability to destroy or deny the enemy critical resources faster than they can recover, classic attrition warfare techniques are being employed. In this context the Battle of Trafalgar may be seen as one conflict within the broader naval war of attrition that was waged for many years and ultimately secured British sea communications across the globe. During the Napoleonic Wars, the Royal Navy successfully implemented strategies for controlling its own sea communications and denying the use of the sea to its enemies. Not shying away from battle when it had tactical advantage, the Royal Navy was able to sustain effective control of the sea for much of the period and ultimately to assist, through maritime power projection operations, the decisive land campaigns that led to Napoleon's overthrow. 'Seapower is attritional, with battles and campaigns forming part of the gradual, cumulative process that wears down an enemy's resources and creates a dominant position at sea that can be turned to strategic advantage'. This re-evaluation of Trafalgar should not be seen as denigrating the bravery and discipline of the many sailors - British, French and Spanish - who fought and died during the battle itself. The death of the legendary commander Lord Nelson, along with the fact that Trafalgar was the last fleet action of the Napoleonic Wars, became linked in the imagination of the British nation to the idea that the Royal Navy had effectively gained control of the seas in a single, decisive battle. At long last, and in many minds, the natural destiny for the British peoples had been achieved; Britannia was seen to 'rule the waves'. In recognition of Trafalgar's place in history, the Royal Navy has arranged a number of international activities to mark the 200th anniversary of the Battle of Trafalgar, and the RAN participated in the activities organised during the UK summer. HMAS Anzac (III) represented Australia among the 40 navies present at the International Fleet Review (IFR) and subsequent International Festival of the Sea in Portsmouth, UK during June 2005. Anzac (III) was also second in the column of six warships that conducted a steampast of Her Majesty the Queen to conclude the IFR. ↑ 'The Influence of Sea Power upon the French Revolution and Empire, 1793-1812 - Volume II', AT Mahan, Little, Brown and Co, Boston, 1892, p. 126. ↑ 'A war-fighting philosophy that seeks to defeat the enemy by shattering their moral and physical cohesion - their ability to fight as an effective, co-ordinated whole - rather than by destroying them physically through incremental attrition.' Royal Australian Navy, 'The Navy Contribution to Australian Maritime Operations' (RAN Doctrine 2 - 2005), Defence Publishing Service, Canberra , 2005, p. 246. ↑ 'Nelson's War', P Padfield, Hart-Davis & MacGibbon, London, 1976, p. 172. ↑ 'Naval Warfare in the Age of Sail: The Evolution of Fighting Tactics, 1650-1815', B Tunstall, Conway Maritime Press, London, 1990, p. 173. ↑ 'Naval Strategy', AT Mahan, Sampson Low, Marston & Company, London, 1911, p. 199. ↑ 'Modern Naval Strategy', R Bacon, Frederick Muller, London, 1940, pp. 65-6. ↑ 'A style of warfare characterised by the application of substantial combat power that reduces an enemy's ability to fight through the loss of personnel and equipment. It is a concept which relates to maritime warfare at the operational and strategic levels, since by their nature successful tactical actions in the maritime environment generally achieve destructive effect.' Royal Australian Navy, 'Australian Maritime Doctrine' (RAN Doctrine 1 - 2000), Defence Publishing Service, Canberra , 2000, p. 141. ↑ 'War at Sea in the Age of Sail, 1650-1850', A Lambert, Cassell, London, 2000, p. 17.